Do not confuse or combine her with Marie Adrienne Françoise (known as Adrienne), marquise de Lafayette (1759–1807), French émigré and memoirist married to Gilbert du Motier, the famous marquis de Lafayette who fought in the American War of Independence. Marie-Madeleine Pioche de La Vergne was born into a wealthy family of the minor French nobility. She became a maid-of-honor to Queen Anne of Austria and began her literary education at the French Court and in the salons of Paris. In 1655, she married François Motier, comte de La Fayette, with whom she had two children. She formed her own successful salon and a close friendship with François de La Rochefoucauld, who introduced her to many literary celebrities of the time. She was also close to Henrietta of England, duchesse d’Orléans, sister-in-law of King Louis XIV, who asked Madame de La Fayette to write her biography. 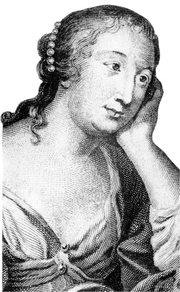 Her novel La Princesse de Clèves, published anonymously in 1678, is now regarded as a classic and the first modern psychological novel. Madame de La Fayette is currently considered a "single author." If one or more works are by a distinct, homonymous authors, go ahead and split the author. Madame de La Fayette is composed of 39 names. You can examine and separate out names.